Now that it’s soup season, I’m pulling together an awesome recipe book of 10 delicious low carb soup recipes that you can enjoy on your path to healthy eating, weight loss or simply a well-fueled body. It got me thinking about post-soup regret. That’s what I call it when you eat a really delicious soup, but you feel hungry or have a craving soon afterwards, so you reach for the bread, sweets, chocolate or whatever it is to satisfy you. Soups can be very nutritious, but it’s important that you understand what can go wrong with soup, and the four things you can do to get them just right so you can lose weight or maintain a healthy weight, AND meet your nutritional needs. Can you Lose Weight Eating Soup? To lose weight eating soup, you could include a hearty low carb soup for lunch or dinner (once per day) instead of a big heavy meal. This is a great approach but it will ONLY work if you get your soup ingredients right. I say this because soups can be imbalanced in nutrients and you won’t notice this while you’re eating them. 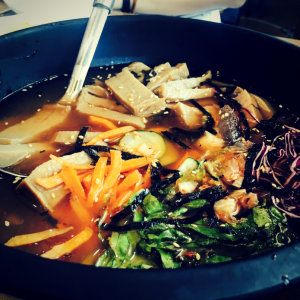 Have you ever had a lovely bowl of soup, then felt ravenous an hour or two later? Or have you ever enjoyed a delicious soup, but had sweet cravings afterwards? Either of those things can happen because it feels satisfying at the time, but if it’s nutritionally incomplete, the soup will leave you feeling hungry or craving sweet stuff within an hour or two. And guess what happens then? You crave and eat other unhealthy stuff that interferes with your weight loss. Like a mother-load of bread (unless of course it’s this cauliflower bread, this life-changing bread, this zucchini bread or this pumpkin bread). Here are some common soup fails to watch out for, followed by the 4 secrets to getting it right. Your body loves and needs nutritional balance in order to feel satisfied. And it’s fibre, protein and fat are the macronutrients that help us to feel satisfied and turn down your appestat. You could say that your appestat is a bit like your ‘appetite thermostat’ – it’s the thing that helps you to feel satisfied after a meal, and to stay that way for a good 3 – 4 hours. On top of that, your brain tells you that you’re more satisfied if you have to chew your food, rather than drink it. So if your low carb soup lacks protein, fibre and/or fat, you’re probably setting yourself up for hunger and cravings. In that context, here are 4 common soup fails to watch out for. Clear soups (e.g. watery, no chunks of vegetable, meat or legume) are popular for people who want to eat low carb soup, or to use for a so-called soup cleanse. But a watery soup with very few calories and hardly any ingredients is guaranteed to leave you hungry soon afterwards, and wanting something else more ‘filling’- like bread. This is a version of the one above. If your soup is mainly cauliflower, celery, or tomato, without many other ingredients, it means your calorie content, fibre and protein content are low and the soup is unlikely to be satisfying for very long. Then you’ll be hunting for something else, or something sweet. If a soup is too starchy – in other words if it contains lots of starchy root vegetables, rice or even legumes – there’s a good chance you’ll have sweet cravings within an hour or two of eating the soup. This is more likely to happen if you’re a mesomorph or endomorph body type. The reason we add things such as coconut cream, olive oil, meat or legumes to soups is because (as mentioned above) the fat, fibre and protein in those ingredients help to squash cravings and help you to feel satisfied. Some vegetable-based soups are low in fat, and either fibre or protein, so they are nutritionally incomplete. Examples include cabbage soup or plain tomato soup. Here’s the quick-fix – if you love any of these soups I’ve just mentioned, all you need to do is serve something else with them to add those missing nutrients. A large side salad with eggs or lean protein. Some tofu cubes or olive oil. Have those soups as a starter and follow with a main meal. One of our tasty low carb bread recipes – cauliflower bread, life-changing bread, zucchini bread or pumpkin bread. 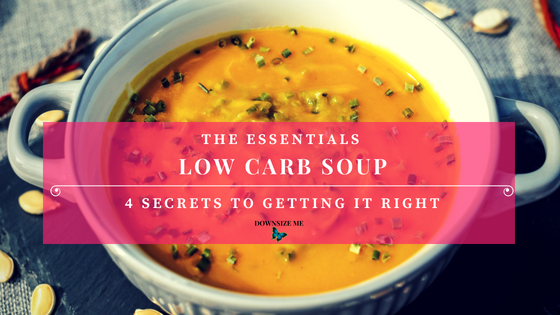 Of course, if you really want a satisfying low carb soup that’s an all-in-one meal, that’s nutritionally complete and will leave you totally satisfied, then here are the 4 secrets to get it right. When it comes to winter-time eating, our nutritional needs might change a little. Generally speaking, in ‘soup season’, we tend to need more satisfying meals – with heavier proteins and a little more fat in our diets. Keep that in mind as you read these four secrets to satisfying, low carb soup that’s an all-in-one meal. A plain, boring soup without much flavour will leave your taste buds wanting for something else. Adding fresh herbs to your soup – especially parsley, thyme, oregano, marjoram, basil and/or coriander (all good liver support herbs and full of vitamins) – then you’ll instantly increase the nutritional value of the soup and make it taste better. 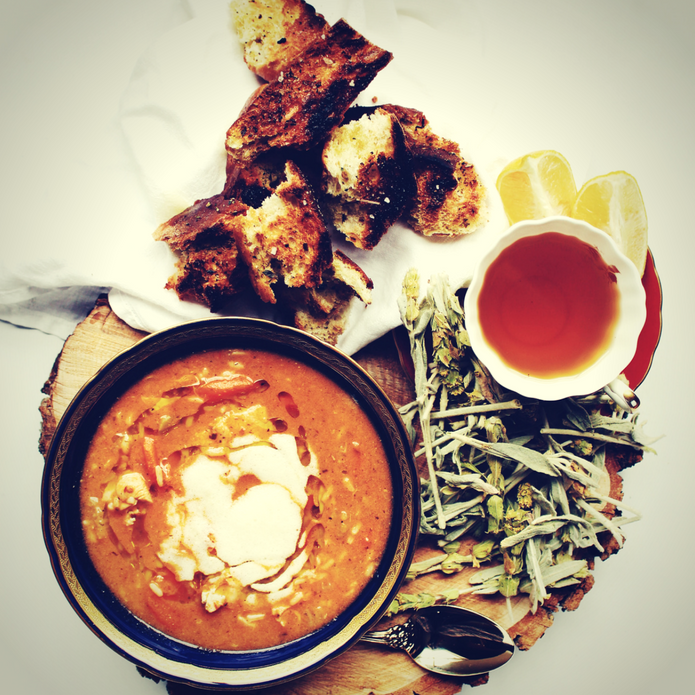 Herbs are the flavour-foundation of a nutritious, low carb soup that’s an all-in-one meal. They will definitely improve the nutritional balance and better taste naturally means a greater sense of satisfaction. Protein is the second must-have for a nutritionally-balanced low carb soup. To your herb base, you can add lean chicken, beef, lamb, fish, eggs, beans, tofu, tempeh or lentils to the soup to increase the protein content. Remember that legumes (beans, lentils, chick peas etc) have less than half the protein content of animal proteins, so you may need to add something else to the meal to increase your post-meal satisfaction. Note – if you have a protein-based soup with no carbs, you’ll probably have cravings after the meal – see secret #3 to avoid this! You’d naturally think that all soups include vegetables, but it’s not always the case. 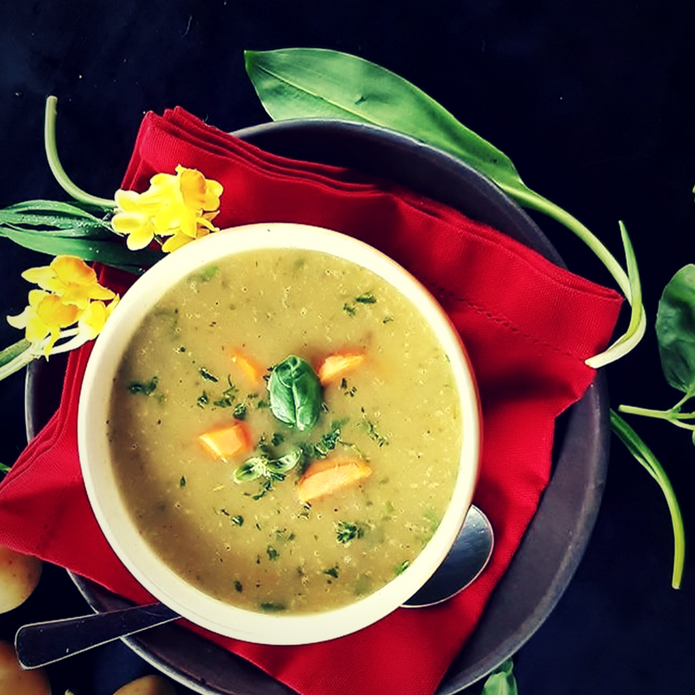 The third addition to your healthy low-carb soups is your inclusion of mainly above-ground vegetables, with one type of root vegetable OR some legumes for added fibre. The green leafy veg like spinach add antioxidants, alliums like garlic and onion add a beautiful flavour, and moderately starchy veg like cauliflower, pumpkin and carrot add fibre and bulk. Vegetables add some healthy, slow carbs and much-needed fibre to appease hunger and deliver satisfaction so you can avoid post-meal cravings that can occur when you eat too low carb. A lot of people think it’s best to eat low fat soup, but as you have probably learned by now, healthy fat is one of the macronutrients that makes a soup satisfying. So the final ingredient in your soup is a fat for long-lasting satisfaction after the meal. If you’ve added an animal protein to your meal, it contains fat anyway, so you probably don’t need to add any other fats. But if your soup is vegetarian, you can add yoghurt, or a little coconut cream, or some olive oil, or some chopped nuts and seeds, to balance out the macronutrients in your soup. So, those are the four steps for an all-in-one low carb soup. Of course, feel free to make any other soup you like, and add a side dish or main meal to balance out the nutrients. Or check out the soups and other delicious meals in our Downsize Me Volume 1 or Downsize Me Volume 2 recipe books. A hearty, satisfying low carb soup will help you to lose weight or simply be healthier. To get the nutritional balance right, there are four things you need to get right so that you can enjoy every minute of feeling, being and eating healthy (without any after-soup cravings and regrets). Those things are – herbs for wonderful flavour, and the right mix of protein, fibre and healthy fat for post-meal satisfaction. Does your favourite soup fit the bill? How could you balance out the nutrients? Post your questions and comments below. Want some help getting your thinking, eating and habits sorted out? 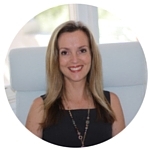 Book a confidential enquiry with Melanie. I’m a quirky scientist and a Health and Wellness Coach who helps 35+ women to understand and eat right for their body type.